Today was a dreary and rainy sort of spring day, so despite not having to work or run errands I didn't get out in the yard as I had planned. I did make a dent in the chaos that we call the office and the usual household chores, but I can't wait to get back into that yard and get working on the garden. Tomorrow I judge my last Forensics tournament of the 2012 season and I'm sorry to see the season end so soon. But I do look forward to knowing that (for the most part) my Saturdays will be mine again. Richard has put a seed tray to start seedlings in his window at school where they will receive lots of sun to get them ready for the vegetable garden and the front flower beds. The photo is from last week and while I haven't seen any more progress Richard promises that a few of them already need transplanting. I'll start some of the herbs soon and send them over for the same care. While we were in the yard yesterday Wicket discovered that sticks are for both fetching and chewing. She proceeded to bring that exact stick into the breezeway each time we returned from playing fetch in the yard, and that's where is resides even now. 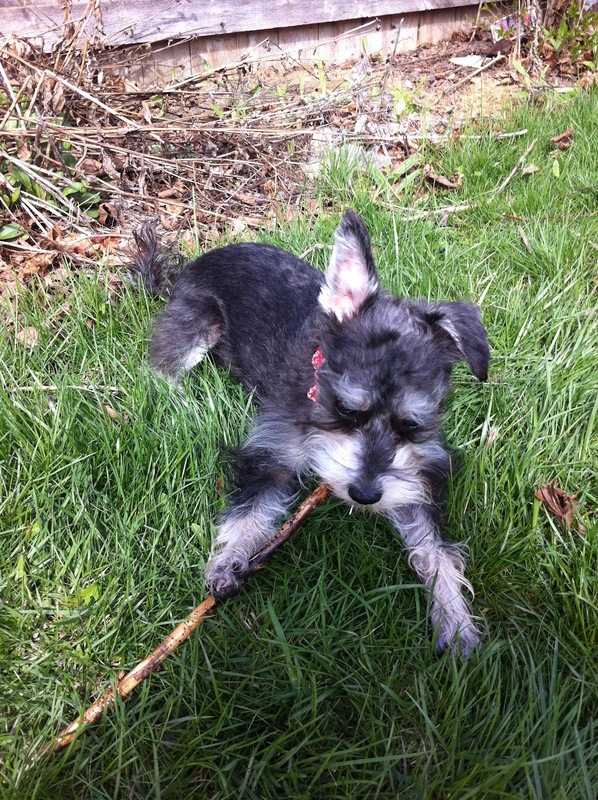 There is no doubt she has claimed that stick as her own. Speaking of spring, one of the perks of Richard's teaching job is looking forward to spring break. We're taking just a few days to visit family out-of-state before returning for what is sure to be more yard work, basement work, and just work in general. It'll be Wicket's first real road trip as the furthest she's been before was to Madison and Oshkosh. She's a trouper though, and we can't wait to see her meet Diego, her canine cousin of the Mexican hairless variety. Does anyone else look forward to spring break as much as we do? Or is that a feeling reserved for students and those that teach? Either way, I hope everyone's gearing up for what looks to be a beautiful spring. Sunday was a really georgous day weather wise. Everything is in bloom and the sun was shining and it was just cool enough to wear a light jacket to protect my arms while I pruned the roses. It was so nice that we spent the better part of the day working in the yard. There are a lot of things I need to learn how to care for in our little outdoor space, like the blackberry bushes and the peonies. We're taking out two trees (dead from rot) and three unidentified red bushes that take up more space than necessary and are in the way of my future vegetable garden. We're still trying to find a way to transplant the apple tree from the back garden to my parents' home because its trying to get into our foundation where it is now. We installed one of our rain barrels last week and the recent spring rains had it filled to the brim. Richard came home with a second rain barrel on Saturday night from the German Immersion Foundation dinner and silent auction. It's blue and covered in red and white handprints from the kids who painted it. The night ended cooler than expected as we gathered with Richard's parents and grandfather around a fire fed by old cabinet pieces. It didn't take long before we retired indoors for some hot cocoa before everyone went home. Despite no longer posting my weekly goals on the blog I have been able to keep up with them. Which I think is saying something since we're already into March and I'm still going strong. One of the things I've gotten back to doing is keeping all my lists in one place. Not only do I make one primary list of the big things I hope to accomplish that week but everyday I have a list of all the little things I need to accomplish for the day. I don't use any fancy planners or anything, just a small notebook (this one if you're curious) that's easy to tote around so I can write things down whenever I think of them. I've found it really helps me to write down even the littlest chore for each day as a simple reminder that there are things to be done. And putting a box at the beginning of each task to check off when I'm done not only helps me keep track of what's left to do but keeps me motivated to keep checking off the tasks. Today was just a lovely day. Wicket and I took a nice stroll through the neighborhood enjoying the sun and the ever so slight warmth. Later I met up with my father for lunch and after we were done I walked over to the Apple store to say hello to our old neighbor Tom before going home. I had the fortune to walk in just before he started his lunch break so I got to spend a whole hour chatting with him before he had to go back to work and I had to come home. It's just so nice when a really nice day comes out of last minute plans and sunny mornings.